The undisputed park champion. This multi-award winning Park snowboard is known by park riders around the world for its familiar ride year after year, proven durability and top shelf performance. 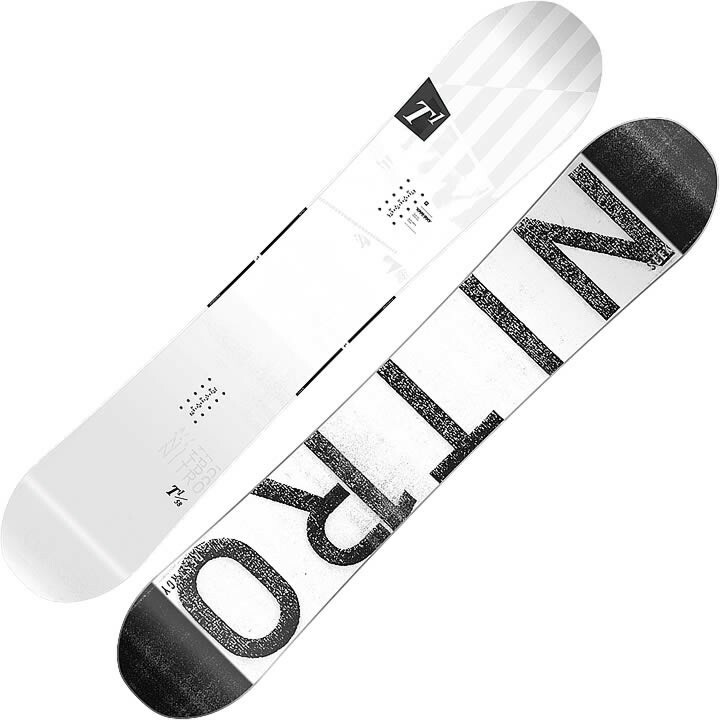 The Nitro T1 snowboard is the ultimate Park weapon of choice has been curated over years of technical mastery and evolutionary design by some of the best park rider around the world. The T1 features Nitro's Cam-Out Camber, which means there is standard camber to the tip and tail with an early lift off before the contact points for the perfect blend of pop power and stability underfoot with the forgiveness and sky high press-ability of early lift at the tip and tail. Equipped with Nitro's RailKiller Edges, twice as thick with 200% more impact resistance than Nitro™s standard edge, for worry free rail sliding all year long. If you are looking for your next snowboard for hot-laps through the park all day long, season after season, look no further than the award-winning T1 snowboard. Deemed "One of the most durable freestyle boards outhere". Powercore II: The Powercore II is a tip-to-tail poplar wood core with additional beech wood stringers for unrivalled strength, smooth response and insane snap. Railkiller Edge: Your secret weapon for rails, rocks and longevity! With its unique edge profile and an impact resistance of more than 200% compared to a standard edge " the Railkiller Edge is twice as thick and twice as strong. This proprietary construction can take on any rail challenge. Take a file to them or ride them hard and wear them down naturally, this chunk of steel has enough meat for years of abuse.